mobileWOMEN.org: You Can Garden too! When I was growing up, we always had a vegetable garden and even at a young age, I thought the vegetables tasted sooooooo much better! Since my C5/C6 spinal cord injury, I haven’t been able to have one because I wasn’t able to convince those around me to plant or maintain one for me for an entire summer. Then one day, I was fortunate to find the Suburban Farming Company, a company that does both for me. It has been a few years now that I’ve been enjoying fresh, organic vegetables all summer long as well as my neighbors and friends because we always end up with too much! Organic refers to food that contains no preservatives, no added chemicals, fertilizers, coloring and is not genetically modified. Organic vegetables are more nutritious but are often expensive so growing your own makes sense. Even though I wasn’t actually doing the work, I loved going out every day to see the progress and watching over it. However, at times, it was a little bittersweet because I just wanted to get in there and get dirty! 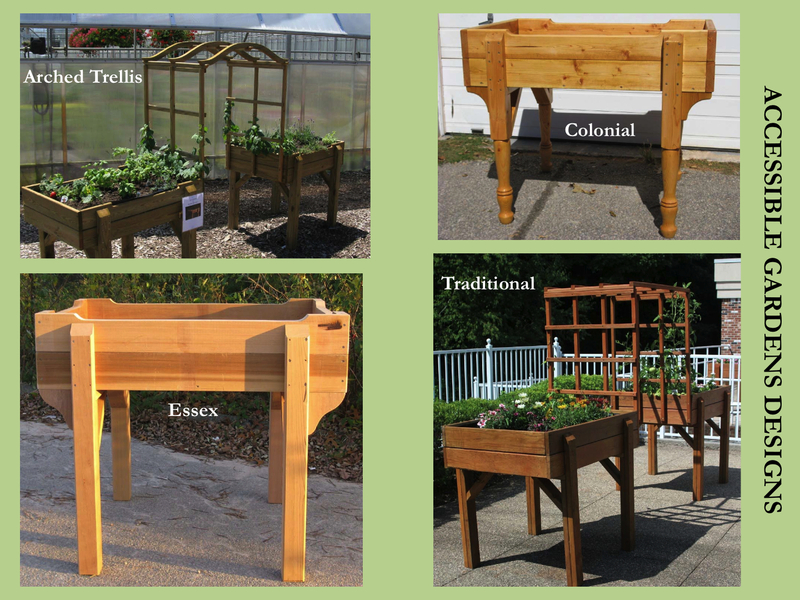 I’ve always wanted to garden but didn’t think it was possible until recently when Ron Ziegler, the owner of the company, mentioned that he was now selling accessible raised garden beds. These can be custom made or you can buy adjustable beds to fit various chair heights so your chair can go underneath and you are able to reach. They can even be decorative with arbors etc and are perfect for those who don’t have area to plant or just have a patio. So Ron brought one over for me to try and this spring, I was able to mix the mulch into the soil and plant beans for the first time since my injury! My hope is that you will try gardening too. It’s not too late in the season, if you get started now. Aside from the obvious that homegrown vegetables are more nutritious, affordable and readily available, additional benefits of gardening include that it allows you to get fresh air and sunlight which is important source for Vitamin D, you can connect with nature and it is multigenerational! How wonderful would it be as a project with your kids on the weekend? So here are some gardening tips that I’ve found that may be helpful for you. I use my exercise grasping gloves to help me to hold any small gardening tools but a universal cuff with added velcro or a simple tensor bandage wrapped around your hand and tool can work too. I was able to find plastic tools at a local Walmart which are lightweight or if you can’t find any, try tools made for children because they are lighter and smaller (although I must warn you that the ones that I found were pink with Barbie on them!). You can also find tools with an extended handle to make it easier to reach. Consider storing garden tools directly underneath or on the side of your raised bed by hanging them for easy access. Cup hooks are good for hanging tools or hanging a bag or pail of accessories. Lastly, here’s a great tip that I found. Use a gardening wagon or child’s wagon for transporting heavy soil and mulch. The height makes it easier to reach and they usually have an extended handle to pull. The low sides keep items from falling out yet makes it simple to get them in and out. It’s important to prep the soil first with compost to add nutrients to the soil. I use my grasping glove to hold the trowel. It doesn’t really need to be mixed thoroughly to be effective. Now you are ready to plant. With the trowel, make an indented row for the seeds. Check the seed packets for specific instructions as not all the seeds are the same. I find the easiest way for me to hold the seeds, is to put them in an empty prescription bottle. Carefully pour the seeds into the trench that you created. Another option is seed tape which is made of biodegradable paper that contains perfectly spaced seeds. Then use your trowel to cover up the seeds. After planting, water the garden. Raised beds require frequent watering to keep them from drying out. As the plants grow, if you see the soil is dry below the surface, then it’s time to water. Remember, it is better when watering, to give the garden a good soaking than to water lightly every day. This allows for better root growth. I prefer a drip or soaker hose which can be placed under the soil and put on a timer so it will water the garden all by itself. Other options include lightweight and self-coiling hoses that are easier to manage. There is a variety of nozzles to choose from that are simple to operate and to extend your reach so find the one that works best for you. For weeding, if you can pull the weeds by hand, use a claw or a weeder, a special tool that is designed for weeding which is like an inverted rake. Pulling out the roots is sufficient even if you can’t completely remove the weed. Sometimes, you will encounter diseases or insects attacking your bounty. For many, the natural instinct is to spray a weed killer or pesticide but DON’T, if you want your vegetables to be organic. Instead search the Internet for a variety of natural remedies that are inexpensive and safe such as Murphy’s Oil Soap diluted in water to get rid of unwanted insects. Even something as simple as planting a marigold with the vegetables, will help to prevent ants. Herbs and flowers will attract beneficial insects. All your hard work has now come to fruition! Picking the veggies can be tricky with limited hand function because you don’t want to pull the roots out too. You could try scissors with a spring that automatically contract, a reacher or a universal cuff with a knife, if you are careful. See Wendy's instructional videos on Introduction to Organic Adaptive Gardening, Planting an Accessible Garden and Adaptive Gardening Tools on mobileWOMEN’s Youtube channel. It’s always good to learn tips like your posting. I just started posting comments for blog and facing problem of lots of rejections. I think your suggestion would be helpful for me. I will let you know if its work for me too. Thanks and keep posting such an informative blogs. You may know me by Client is able to buy such Salvage jeep at any of well-liked insurance coverage save online auctions. He can anticipate to determine a very money-spinning contract if he controls to bid better than others and provide the best price lastly. No issue if you make use of online insurance coverage save vehicles online auctions or community ones you have to keep in mind about certain guidelines helping to keep away from problems and on the in contrast to get earnings from your purchase of a save vehicle by the use of insurance coverage online auctions. Your blog on Vagetables garden very amazing plantation .We are got many tips about garden . I am sure all people will be get Information ,vitamin & fruts etc form this blog . We can get cheap price about gaden tools.Actually , I support this your blog .Here you can share as Do you know Mental health disorder symptoms? This blog motivates depressed people to get better by positive thinking and urges them to change their thought pattern and to feel strong. A greater focus is on the topic of teenage depression and help for adults who had depression as early in the teenage This blog also helps people with anxiety and other mental health disorders.. Many many thanks for your Acceptable Blog . Unique article, Thanks for share with us, I liked it, Good luck!! !